I've not really had many holidays. I recently only got my passport last year (or maybe it was the year before) but I've only used it twice. My first holiday was to Rome a couple of April's ago. The weather was scorching and the sights and views were amazing. I took tons of pictures and loved every minute of it. This was my first holiday abroad and was my first plane journey. My second holiday was a few months later to an island in Spain 'Menorca' not to be mistaken by Majorca. My friends family own a villa and so we spent a week there - it was amazing. Most days we lazed by the pool, and at night ate out at a few restaurants. 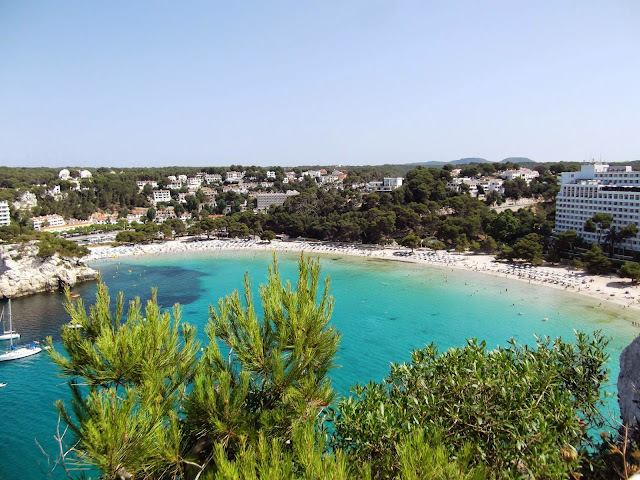 The picture above is of Menorca and the beach closest to the villa. We went out on a little pedal boat during the week. The sand was that hot you couldn't walk on it bare foot. I think we are going next year so looking forward to that, although we are going in August so - it will be hot, hot, hot! To be honest ... I don't think I've ever had a horrible/bad/worst holiday. Even as a child my parents took my brother and me to Blackpool - we were pretty young so the lights, tram and pleasure beach kept us occupied and I can say I really did enjoy it. What about you? Any good holidays? Any bad holidays?